Just twenty years ago Wigan Athletic were in dire straits. 1993 had been a bad year for Latics, losing their place in Division 2 – the third tier of English football – after an eleven season stay. Long serving manager Bryan Hamilton had left in March, to be replaced by Dave Philpotts, but to no avail. Now Latics were in free-fall, struggling in the drop zone of Division 3. New manager Kenny Swain was to have the unenviable task in keeping Latics in the Football League with a rock-bottom budget. The prospect was looming of a return to the realm of non-league football, which had been their home for 46 years prior to election into the Football League in 1978. Fans breathed a sigh of relief when they eventually finished in 19th place. 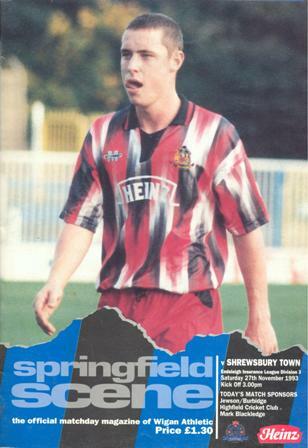 The average attendance in that 1993-94 season was 1,897. Twenty years on and Latics have been relegated again – this time from the first tier to the second. But 2013 has not been such a bad year for Wigan Athletic. They won the FA Cup, they have a good chance of qualifying for the knockout stage of the Europa League and they have a squad good enough to make a fair crack at getting back into the Premier League. After 7 home matches the average attendance for Championship matches stands at 14,986. Wigan Athletic’s fan base has grown way beyond expectations. A fascinating study by real estate company Rightmove in August 2012 revealed that Latics had the highest level of local support of any club in the Premier League. Rightmove found that 65% of Wigan Athletic’s fans live in the same post code as the DW Stadium. Norwich came a close second with 61%, Southampton next on 51%. The study showed each of the big four northwest clubs – the two from Manchester and the two from Liverpool – having a score of less than 20%. Manchester United finished bottom on 9%. The big four from Manchester and Merseyside clearly attract a lot of support from outside their city. For so many years the media ridiculed Wigan Athletic’s level of support. The defence was that Wigan was a small town of 81,000 people that supported both football and rugby. The big clubs from Manchester and Liverpool drew prospective fans away, let alone the neighbours up the road in Horwich. However, the truth is that Wigan can support the two sports. In fact the rugby club had its largest ever average attendances during the time Latics were in the Premier League. Getting reliable attendance data for the Warriors is not an easy matter. Wigan Athletic publish their historical attendance data on the club website and it makes fascinating reading. The Warriors do no such thing, neither does the Super League. 2013 has been a good year for the Warriors, winning both the championship and the Challenge Cup. Sky Sports quotes their average league attendance at 13,556. Their clash with St Helens – as almost always – drew their best of the season at 23,861. Their lowest was 6,327 against Widnes. Latics averaged 19,375 in the 2012-13 season. A couple of years ago I published an article “1932 and all that – Is Wigan a Rugby Town“. I used data from Wikipedia to compare the attendances of Latics and Warriors. The updated figures are shown in the table below. The figures for Latics have come directly from the club’s official site. Those for the Warriors from 2006-2010 come from Wikipedia. Those for 2011 and 2012 come from the Wiganwarriorsfans.com fan site. Wigan Athletic’s average attendance went up by almost ten times from 1,897 in 1993-94 to 18,568 over the eight years in the Premier League. A remarkable transformation in a space of 20 years. Moreover the current average of around 15,000 is a good sign for a club that has been relegated, with a team that has not yet hit its best form. Gone are the days when the media can ridicule Latics’ attendances.